1. In large bowl, combine 3 tablespoons flour, 3/4 teaspoon salt and 1/2 teaspoon pepper; add beef and toss to coat. In large saucepot, heat 2 tablespoons oil over medium-high heat. In 2 batches, shaking off excess flour, add beef to saucepot, and cook 4 minutes or until beef is browned, stirring occasionally. With slotted spoon, transfer beef to large bowl. 2.Add remaining 1 tablespoon oil, carrots, onion and squash to saucepot; reduce heat to medium and cook 5 minutes or until onion begins to soften, stirring occasionally. Add mushrooms; cook 5 minutes or until mushrooms have released their moisture, stirring occasionally. Add garlic, cook 1 minute, stirring occasionally. 3.Add 1 cup stock; cook 1 minute, scraping browned bits from bottom of saucepot with wooden spoon. Stir in remaining 2 tablespoons flour and stock. Add beans, tomatoes with their juice, rosemary sprigs, bay leaf, remaining 1/4 teaspoon each salt and pepper, and beef with any drippings in bowl; heat to boiling. 4.Reduce heat to medium-low; cover and cook 1 hour. Uncover; cook 45 minutes longer or until beef and vegetables are tender, stirring occasionally. Remove and discard rosemary sprigs and bay leaf before serving. Makes about 14 cups. 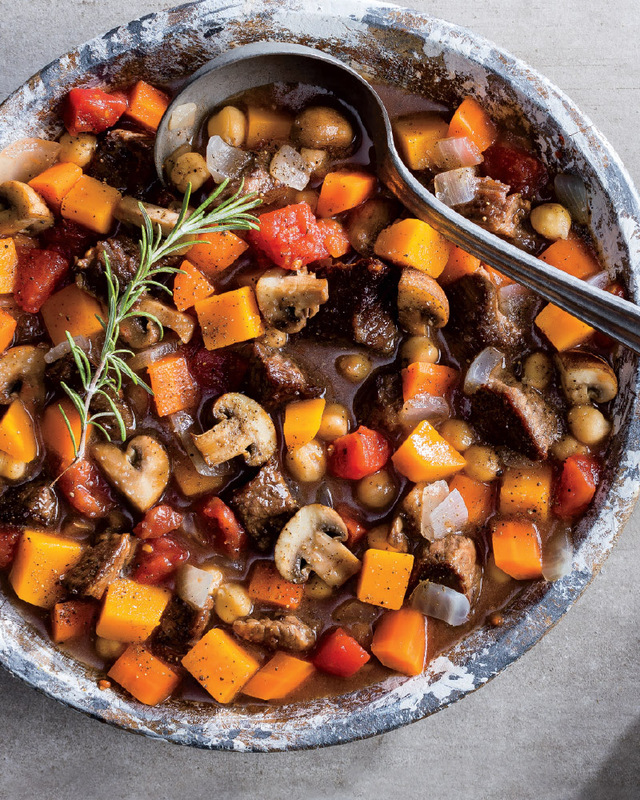 Since cooking times may vary, if the meat is not tender after the specified cooking time, continue to cook the stew, checking the consistency of the meat every 15 minutes. > To reduce sources of added salts in stews like this, opt for unsalted broths and no added salt canned goods.